The phylobase package seeks to provide a set of S4 classes and methods for representing and manipulating phylogenetic trees and data in R.
To install the nightly snapshot (on a good day, when they build properly) go to the phylobase build page. 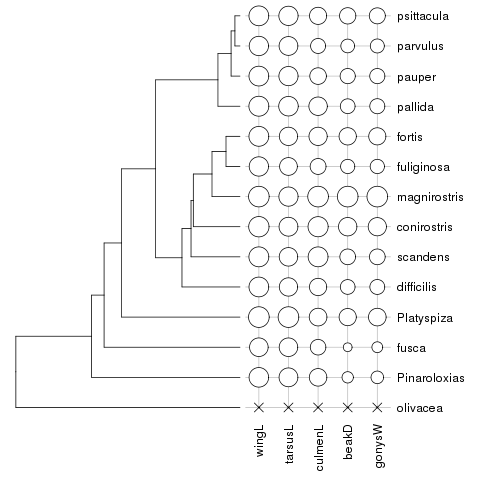 phylo4: classes and methods for phylogenetic trees and data [pdf] gives an overview of the tree manipulation and plotting functions available in phylobase. A developers guide for contributing to phylobase [pdf] provides information about the organization of the package and how to use Subversion. You can contact us on our mailing list. Alternatively, you can send an email the special interest group mailing list on phylogenetic and comparative methods and analyses: R-sig-phylo. The project summary page can found here. project description and progress can be found here.